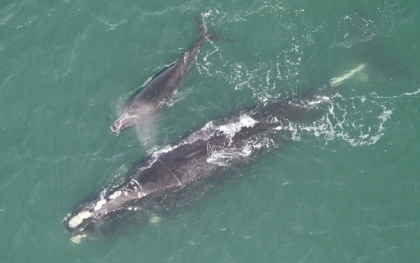 Mid-way through calving season, North Atlantic right whales are putting last winter’s bleak showing behind them. Sixteen calves have been documented off the Southeast through mid-January. The count for all of last season was six. Also, in a highlight for Georgia DNR staff working with one of the world’s most endangered marine mammals, a right whale they helped disentangle from commercial fishing gear in December 2008 (right) was spotted this month off Georgia's coast (above) with a calf. Her first calf since being freed four years ago! The whale, named Equator, is one of the first right whales, if not the first, freed from fishing gear in the Southeast and later documented with a calf. That news, along with sightings of two other entanglement survivors with calves, made headlines. Clay George, DNR marine mammals biologist, said research shows that entanglement undercuts the productivity of females that survive. Equator is bucking that trend for now, joining the approximately 100 breeding females in a population estimated at only about 400 whales. More good news: Calving is trending toward the norm. Right whales migrate from the Northeast U.S. and Canada to calving grounds off Georgia, north Florida and South Carolina each winter. Researchers have documented an average of 22 calves a year since 2001. Sixteen is “a solid number at this point in the season,” George said. And while it’s difficult to predict this winter’s final calf count, he's optimistic it will be an "average to above-average year." What has been below average this season is the number of non-breeding whales. Large numbers of juveniles and other non-breeding whales usually begin arriving in the Southeast by January. More than 100 non-breeding whales have been seen some years. The count so far this season: fewer than 10. Right whale calves draw plenty of attention off Georgia. But when one is born in Cape Cod in winter, it's big news. Like Equator, this mother whale had also been disentangled from fishing gear. One right whale death has been documented in the Southeast this winter, but no live entangled whales. The 2-year-old whale that washed up dead on a Florida beach in December was wrapped in different types of fishing gear, including Northeast U.S. trap/pot gear, which is used to fish for lobster, crabs and other bottom species. Preliminary findings suggest the whale died from its entanglement. Final results are pending. What’s in a name: A female right whale named Blackheart was recently photographed off Sea Island with her first calf. The whale's name doesn’t reveal a researcher’s affection for heavy metal bands. It refers to a worn area of callosities on the whale that, seen head on, is darker and looks like a heart. “We try to name them for things that help us remember them,” George said. Likewise, Equator is named for a white scar encircling her middle from when she was entangled in fishing gear. See photos of other right whales from this and previous years, plus a more unusual visitor to Georgia last month -- a juvenile humpback whale. They came from the mountains, where the winter temperature often hovers on the southerly side of zero. 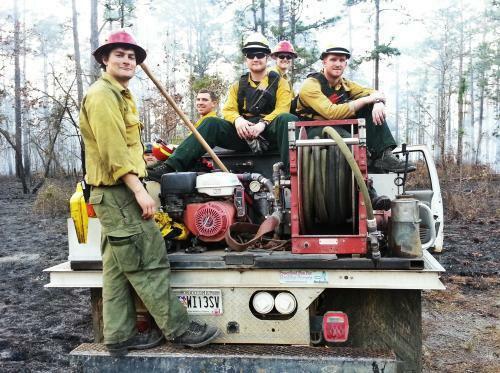 They came with years of experience fighting raging western wildfires, but most had never seen prescribed fire – and a few, like student Patrick Odell, had never been east of the Mississippi. For the sixth year in a row, a group of students and their instructors from the University of Montana arrived in south Georgia this month for a two-week practicum on prescribed fire. Based out of Moody Forest Natural Area, the group – known as the Grizzlies – has been burning at Moody Forest, The Nature Conservancy’s Broxton Rocks in Coffee County, and other Nature Conservancy, DNR and private properties in the area. According to course instructor Jim Riddering, the practicum – which includes reading and writing assignments but is mostly experiential – offers participants a chance for greater leadership opportunities than they might otherwise receive at this point in their careers out West. Another aim, said Riddering, is to give the students familiarity with fire behavior and fuels in the Southeast. For many Grizzlies, this is their first time dabbling in prescribed fire. The Nature Conservancy’s Erick Brown wrote that the class gives students “a chance to connect and have some personal ownership of the benefits of prescribed fire. Watch the 2012 Grizzly crew in action in south Georgia! Hilary Smith is a member of a seasonal fire crew hired by the Nongame Conservation Section. Also read her first-person account of the 2012 burn season. When Arctic weather hits Georgia, we take refuge in cozy homes and don heavy coats, hats and gloves when outside. Frigid weather is little more than an inconvenience to most of us. No so for our bird neighbors. To them, dealing with extreme cold is a life and death struggle. Fortunately, many birds are well adapted for the fight. 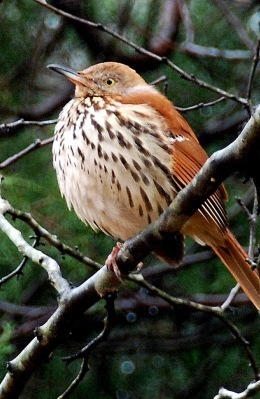 According to the species, some cope by fluffing out their feathers to trap body heat, shivering (black-capped chickadees can shiver while they sleep), slipping into torpor, taking refuge in cavities, or even circling up and roosting in a group, as bobwhite quail do. Find out more about how birds cope with cold – including how they keep their feet from freezing! – in Terry’s complete column! 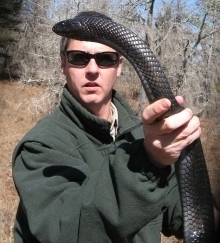 Terry W. Johnson is a former Nongame program manager with the Wildlife Resources Division and executive director of TERN, the Nongame Conservation Section’s friends group. His “Out my backdoor” columns are also archived. Seems a small thing: Contributing $1 or more to Georgia’s Wildlife Conservation Fund on your state income tax form. But small things can add up to great accomplishments. Accomplishments such as helping acquire thousands of acres of wildlife habitat. Thanks to generous Georgians, the Wildlife Conservation Fund checkoff, also called Give Wildlife a Chance, has provided on average $304,000 a year since 1989 for conserving Georgia’s rare animals, plants and habitats. DNR’s Nongame Conservation Section has put those contributions to work: researching rare wildlife such as bog turtles, restoring at-risk ecosystems like longleaf pine savanna and working with conservation partners to acquire vital habitat. For example, more than 37,000 acres have been acquired in the Altamaha River basin, home to some 120 species of rare or endangered animals and plants, varying from Altamaha spinymussels to Georgia plume. This acreage open to hunting and other recreation includes Townsend Wildlife Management Area. Here, you’ll find the state’s largest bald cypress trees, rich habitat for wood storks and swallow-tailed kites, and vast riverine sandhills with dense populations of gopher tortoises and rare indigo snakes (above). The Nongame Conservation Section does not receive state appropriations for conserving rare and other nongame wildlife, creatures not legally hunted for fished for. For this work, the checkoff is critical. The take-home? When filling out your 2012 state income tax form, remember the Altamaha. The Georgia Wildlife Conservation Fund checkoff is line 26 on the state’s long income tax form (Form 500) and line 10 of the short form (Form 500-EZ). Contributions can be deducted from refunds or added to payments. You can give if you file electronically or through a tax preparer. Tax preparers are aware of checkoff options but you will need to instruct them to include the contribution. Download a request letter to provide preparers. Learn more about the Wildlife Conservation Fund checkoff, state tax forms and other ways to support Georgia wildlife. Young birders and artists can register for this year’s Youth Birding Competition and T-shirt Art Contest. The 24-hour birdathon is April 13-14. Boyles Island, 6,277 acres along the Altamaha River, has been acquired by The Nature Conservancy from Rayonier and will soon be sold to DNR. The tract is part of a 106,000-acre conservation corridor key to wildlife including Atlantic sturgeon and swallow-tailed kites. Mammoth Cave National Park in Kentucky is one of the latest sites where white-nose syndrome, the disease deadly to bats, has been confirmed. Gopher tortoise surveys at Silver Lake Wildlife Management Area and adjacent Lake Seminole WMA estimate the areas’ population at 697 tortoises, second on state lands only to Townsend WMA. Weekend for Wildlife received some Washington exposure, with Georgia’s state tree in the 2012 National Christmas Tree display honoring the nongame fundraiser's 25th year (right). 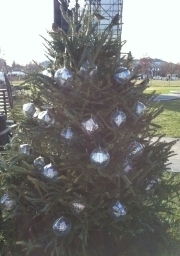 Newton County artist Cindy Murphy designed the ornaments. The silver weekend is Feb. 8-9. A proposed national wildlife refuge would protect part of Tennessee’s Paint Rock River watershed, known for high aquatic diversity that includes rare mussels and fish. Fiscal cliff legislation renewed the enhanced tax incentive for conservation easements, key for land trusts working with modest-income landowners, according to the Land Trust Alliance. The West Indian manatee, an endangered species sometimes found along the Georgia coast, has a heavenly double: a gas cloud the National Radio Astronomy Observatory recently renamed the Manatee Nebula. A U.S. Fish and Wildlife Service publication lauds the Wildlife and Sport Fish Restoration Program, which over 75 years has contributed $14 billion to conservation. Georgia landowners have until Feb. 15 to sign up for the Longleaf Pine Initiative or other conservation-centered incentives through the federal Environmental Quality Incentives Program. Names in the news: Secretary of the Interior Ken Salazar is stepping down. Chuck Sykes is stepping up, as new director of the Alabama Division of Wildlife and Freshwater Fisheries. ** Equator trailing fishing gear on Dec. 18, 2008 (Wildlife Trust/NOAA permit No. 932-1489) and DNR biologist Mark Dodd preparing to cut rope wrapped around the whale (Georgia DNR/NOAA permit No. 932-1489).